The City Council’s Executive Board will consider a proposal to introduce parking charges at Court Place Farm, Marston. This is the site of parking for OXSRAD, Oxford City FC and for the Council itself. It’s said to be used currently by commuters, probably working at the JR. The report to the Exec Board is here. If approved, the proposal will have to go to the County Council as Highways Authority, when it will be opened to public consultation. Bury Knowle Park was again awarded a Green Flag, one of six Oxford parks to receive this recognition. Cyclists beware! @quarry_cycles spotted this cut-through cycle stand in Headington. The cut, covered with tape, lets a padlock cable be forced through so the bike plus padlock can be lifted and carried away. The Headington Shark was in the news this week, being cleaned and repainted to mark its 32nd birthday. Your weekly round-up of local news for 2 – 8 July . Andrew Gilligan’s report on cycling in Oxford, Cambridge and Milton Keynes has been published. Gilligan is Cycling Commissioner for London; the report was commissioned by the National Infrastructure Commission. It catalogues the failings of cycling provision in Oxford – there is nothing that Oxford’s cycling campaigners have not been saying for years. It proposes spending about £150m on improvements, many of them in the Eastern Arc including Headington. The full report “Running out of Road” is here: I suggest reading the Introduction and Chapters 2 and 3 to get the picture of what he suggests for Oxford. The locally unpopular Swan school has been a topic of debate on the e-democracy forum. It’s worth reading the most recent posts (scroll down). St Nicholas School and friends have started work painting new murals on the walls of the Marston underpass. They hope to finish this week. Your weekly round-up of local news for 18 – 24 June. The advisory cycle tracks at the top end of Headley Way have been removed and the central white line shifted. 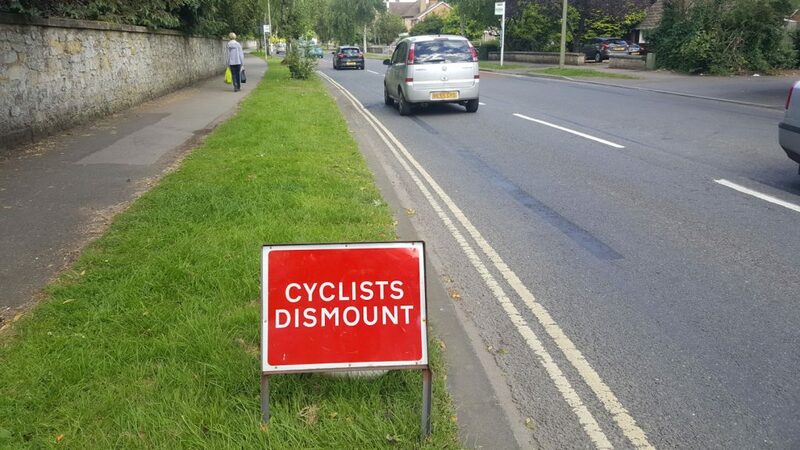 ‘Cyclists Dismount’ signs appeared but after protests they were removed on Tuesday afternoon. The County highways engineers said they had been mistakenly left after some earlier work for which they were needed. County Councillor Glynis Phillips (Barton, Sandhills & Risinghurst) is pressing for the right turn from the A40 into Collinwood Road to be re-opened for the duration of the sewer repair works which have closed Green Road. She says temporary traffic lights would prevent the kind of accidents which happened on the A40 before the junction was closed. The closure of the Six Bells pub in Quarry is confirmed. Greene King are looking for new tenants. Back in November last year, shortly after the new Westgate opened, I wrote a critical article about the lack of cycle parking spaces at the new development. I was sceptical about whether the promised number of spaces required under Westgate’s planning conditions would ever be provided. Now eight months later it seems the requirement might almost have been met. Exact numbers are still uncertain, but the Oxford Mail reports Cyclox as being fairly happy with the latest situation.